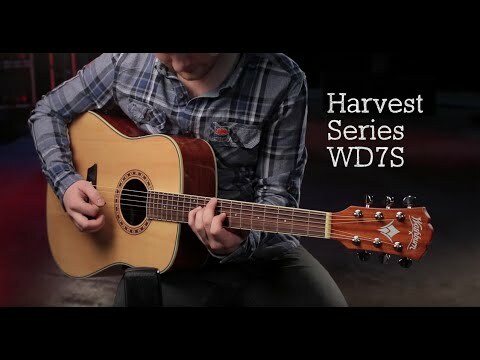 The WD7SCEB is an excellent electro-acoustic guitar from the Harvest Series from Washburn. Featuring a cutaway design with solid spruce top,.. The WD7SCEB is an excellent electro-acoustic guitar from the Harvest Series from Washburn. Featuring a cutaway design with solid spruce top, the WD7SCEB delivers beautiful tone at a great price. As part of the Harvest Series, the Washburn WD7SCE-B, seen here in a lovely black matt finish, features a solid spruce top. Spruce wood has been chosen for the way its tonal quality improves with age. The WD7SCEB also features mahogany back and sides and a rosewood bridge which gives improved tone transfer. Chrome die cast tuners have been used to provide excellent tuning accuracy and stability. A great feature of the WD7SCEB is the integrated Washburn EQ4 preamp which allows you to plug your guitar into an amp; perfect for live performance. The Washburn WD7SCE has a dreadnaught body shape so it can produce some big sounds and is perfect for performing in public areas when you need to be heard above the din. The satin finished mahogany neck with pau ferro fretboard makes playing the WD7SCEB both fun and easy. The neck has a 25.5” scale, features a two-way trussrod, and fretboard has 20 frets. With a custom wood inlay rosette and the glorious black matt finish, the WD7SCEB looks about as good as is it sounds and is sure to impress when playing live.